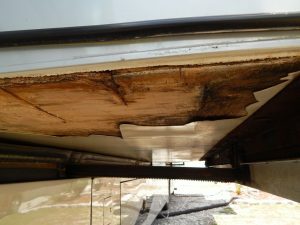 TALIN MANUFACTURING is proud to provide our valued customers solutions to their slide floor rot and damaged slide floor issues. Since our Guardian Plates have hit the market, we have saved our customers from large financial outlays by offering cost effective alternatives. By plating slide floors when damaged, our customers can eliminate the need for expensive slide floor replacements. Below we have listed just a few of our jobs that we have helped customers successfully complete. While we perform slide floor repair and Guardian Plate installs at our Brooksville, Florida location, the vast majority of our plates are installed by coach owners themselves. We would like to make you aware we also provide free consultation over the phone and will gladly look over pictures and advise you on an appropriate course of action. Before allowing a dealer or service center to replace your slide floor, contact us for a free consultation. 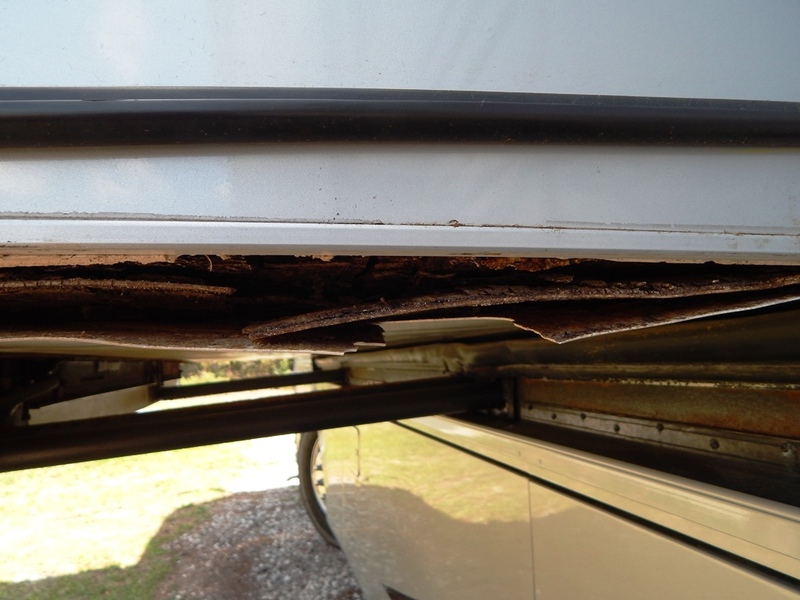 This 2005 AMBASSADOR slide floor was discovered during one of our Rally inspections. The floor was severely rotted and part of the white laminate tore off . During the inspection we advised the owner that the floor could indeed be saved. The customer made an appointment at our Brooksville, Florida facility and upon arrival we got to work. 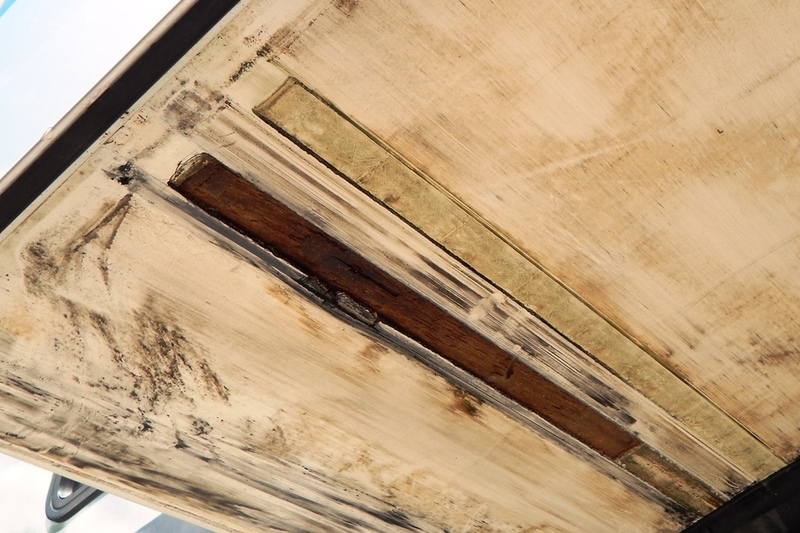 We cut the torn white laminate back to 8 inches from the side edge and removed some of the rotted wood. The slide floor was then layered heavily and built up using 3M-5200. Next a set of 1200 FF Guardian Plates was installed and the floor saved. This slide floor will function perfectly while eliminating any possible slide floor rot in the future. The cost savings after our labor, plate and material charges saved this customer $ 7000 to 8,000 dollars by eliminating the need for a floor replacement. This slide is from a 2008 Dynasty. 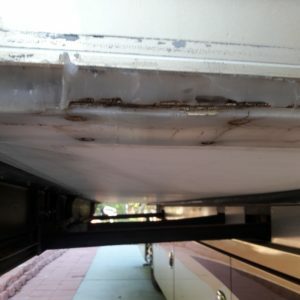 When the customer brought it to us we found damaged areas in numerous areas in addition to floor rot. Not only was there laminate separation on the edges but the floor itself was cut in half from the rollers, which is a common problem on bedroom slides. 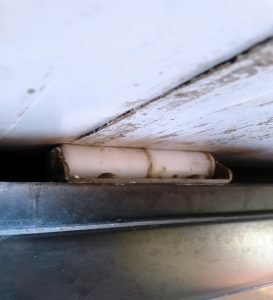 This customer was told by several technicians that the floor would have to be replaced. We constantly hear this same statement from our customers. It is our feeling that over 90 % of slide floors can be saved with a Guardian Plate system. With damage on this slide floor occurring in a number of places – slide edges and underneath – we installed 4 plates ( 2 – 1200 RF Guardian Plates and 2 Custom Roller Plates ). The job was completed by our technician in 6 hours and the customer saved $ 6,000 which was quoted to him for a new floor by a service center. 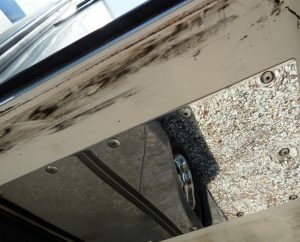 This job was performed on a 2009 Monaco Camelot. The customer who lived out West contacted us and sent us pictures of his cracked plastic glide plates. 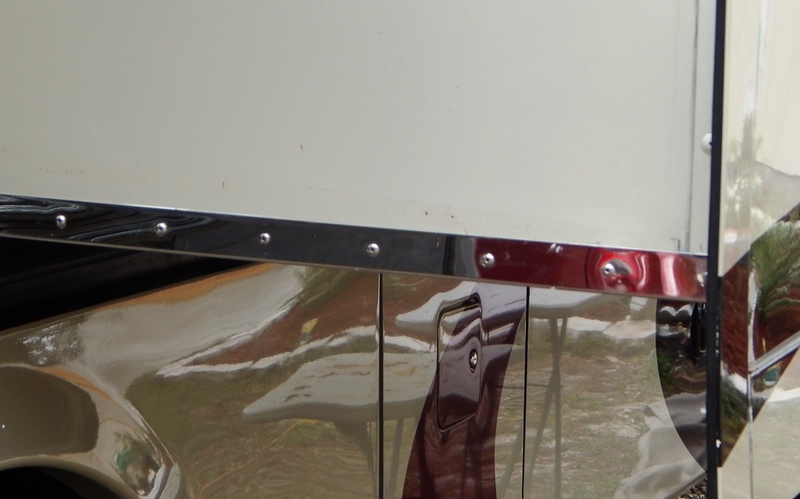 His question was whether he should replace the glide plates with OEM replacements or install Guardian Plates. 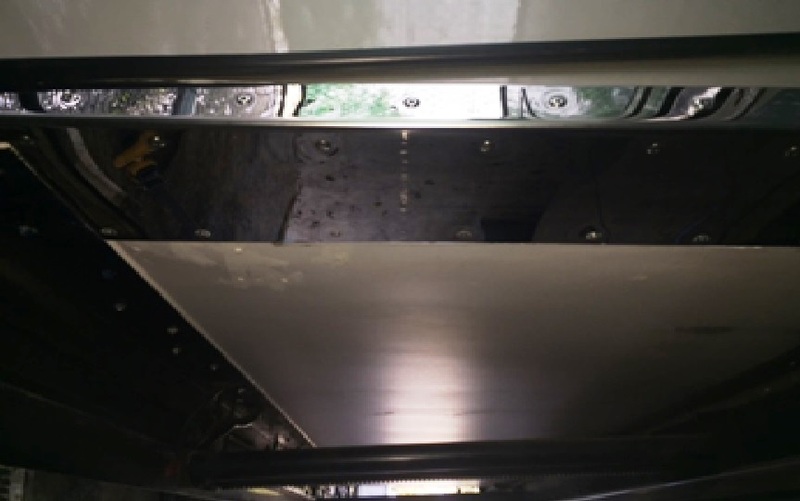 Our advice was to install our 1200 FF Guardian Plates which would take care of the plastic glide plate issue while also eliminating any future floor rot. Simply plating the bottom of a slide will NOT eliminate floor rot issues. We manufactured the Guardian Plates and shipped them to our customer and he installed them himself at home. We provided him with technical support as well as certain procedures to perform over the phone and as you can see he completed the install in a very professional manner. This customer is like so many of our customers who prefer to do the work themselves. 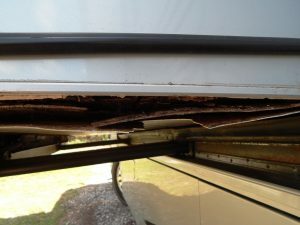 We enjoy working with DIY coach owners and are always proud of the amazing installs they perform while providing them with a sense of accomplishment. 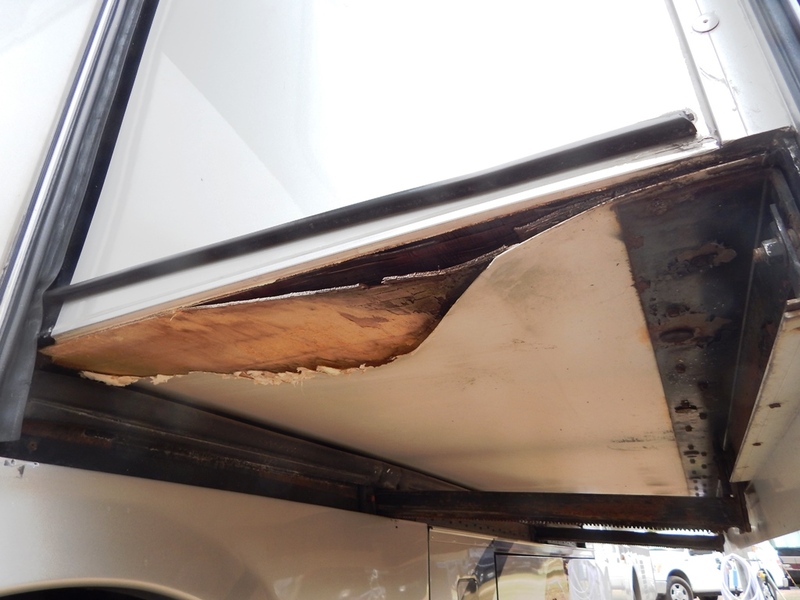 Our customer brought his coach to our facility with major damage to the rear passenger bedroom slide as well as total delamination and missing laminate on the drivers front slide. The repair work took 2 days and included rebuilding the floor using specialized fillers. Loose laminate was trimmed away and the Guardian Plate job started. Because of the amount of torn laminate we custom fabricated extra wide plates for this slide. The total area covered by Talin plating was 28 inches. This area of the slide had extended floor rot issues. We filled and injected this area and then installed double Guardian plates using an additional custom fabricated plate for extended strength. The bedroom slide came out excellent and the damaged laminate repaired with CRP’s ( custom roller plates ). The slide works much easier now with a lot less strain on the motor. 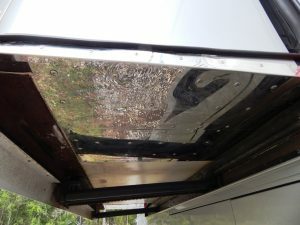 The front drivers slide ( Flush Floor ) with new Guardian Plates installed. We tested the slide afterwards and found the slide to work smooth and with much less effort on the motor. We had concerns about being able to save this floor but found the right solution. The cost savings to our customer versus the total replacement of the floor was over $ 10,000 dollars.